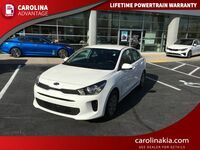 Compact hatchbacks are especially popular among drivers looking for a vehicle that offers more storage space than the average sedan but still gets an impressive fuel economy. 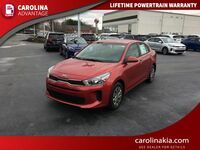 Our team here at Carolina Kia is going to give drivers an idea of how the 2016 Kia Rio 5-door models stands up against one of the most popular compact hatchbacks available on the market - the 2016 Toyota Yaris. The Rio is available as a sedan or a 5-door model, and the Yaris is available as a 3- or 5-door model. 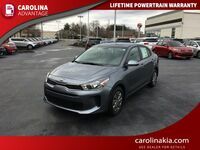 We’re going to compare these at their base models, so keep in mind there are additional features and performance capabilities available on higher models and trim levels. The 2016 Kia Rio 5-door LX and the 2016 Toyota Yaris L are both set with similar sized engines. However, the Rio 5-door does pump out more horsepower than the Yaris. When it comes to efficiency, these two are quite comparable. The Kia Rio is more efficient on the highway, and the Toyota Yaris more efficient in the city. Since these vehicles fall in the compact hatchback segment, drivers often mistake this as meaning lack of interior space when that’s not really the case at all. Both the 2016 Kia Rio 5-door and the 2016 Toyota Yaris 5-door offer seating for five passengers. The Rio comes out on top with more passenger volume overall with 88.4 cubic feet compared to the Yaris with 85.1 cubic feet. Cargo volume in these two vehicles is similar to that of an average sedan. The Rio offers 15 cubic feet of space, and the Yaris offers 15.6 cubic feet for extra belongings. Overall, the Rio 5-door is larger than the Yaris 5-door when it comes to height, length and width. Front seat passengers will notice it the most with 43.8 inches of space to stretch out in the Rio and just 40.6 inches of legroom in the Yaris. When it comes to safety, the Rio and the Yaris are sure to have you covered with standard brake assist systems, child safety locks, low tire pressure indicators and traction control systems. 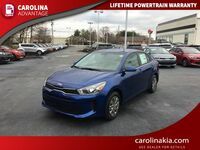 The 2016 Kia Rio 5-door comes out on top with standard height-adjustable front seatbelt anchors and hill start control that are not available with the 2016 Toyota Yaris 5-door L. The Rio also has standard auto-off headlights, a power adjustable rearview mirror and power heated exterior mirrors, which are not available on the Yaris. Drivers who choose the Rio will also enjoy standard remote keyless entry, steering wheel controls and an auto-dimming rearview mirror for convenience. These features are not available with the Yaris base model. 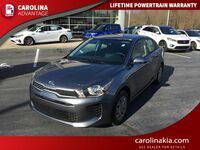 Those interested in learning more about the 2016 Kia Rio 5-door hatchback are encouraged to contact our team here at Carolina Kia for more information. Drivers can get behind the wheel today by scheduling a test drive online.